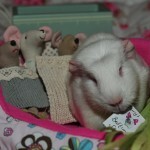 Fairy is a big supporter of Guinea Pig Charities. We hope she inspires her Fairy-Followers to give generously if they are able to! Fairy’s Cuddle Cup beds, Huts and Cosies are sourced from various different suppliers. 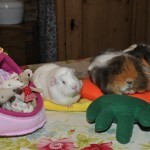 We also have some creative friends who produce various piggy care products and other items. Piggy Lovers United is owned by my lovely friend, Serena. 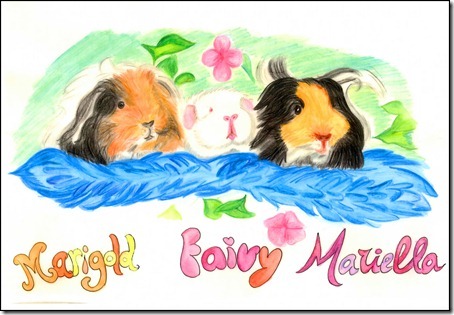 If you would like a lasting reminder of your guinea then ask Serena to create a painting. Here’s one she did recently of our gorgeous trio! The Piggy Palace, is a UK creator of Piggy Plonks, Crash Pads, Flying Angels, Futons and Hammocks among other wonderful small pet treats! Fairy loves her custom Lap Pad and feels like a proper little angel in her . . . Piggy Angel cosy! Cavy Couture, based in the UK, has a wonderful website where you can ‘build your own’ items selecting from a huge range of fabrics and fleece colours. Cuddlers, Tunnels, Cavy Cosies are just a few of the items on offer. They also supply C&C cages. 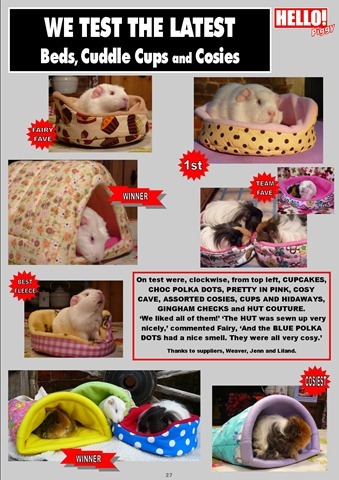 Jen’s Custom Crafts, based in America, make a great variety of products for Guinea Pigs, Ferrets, Rats, Sugar Gliders, hedgehogs, cats, rabbits, and other small critters. Fairy’s Huts came from Jen! 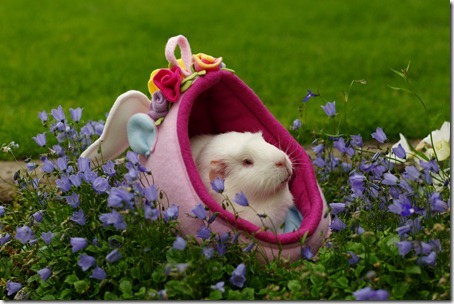 The Cozy Cavy, also in America, is ‘a place where the pampered Guinea Pig likes to shop’! Weaver offers Cozy Cuddle Cups, Saks, Pads and Cottages, all hand made using colourful cottons and fleece fabrics. 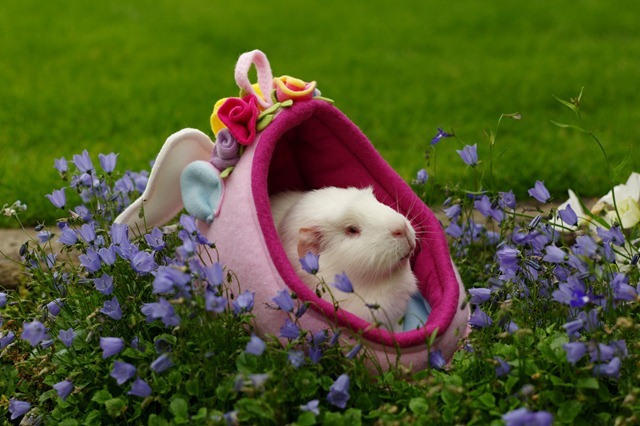 These lightweight cotton and fleece beds and other items are perfect for Guinea Pigs. They can be machine washed and quickly dried. And of course, they come with the ‘Fairy Seal of Approval’! Here’s Fairy performing her Cuddle Cup Comfiness Test! Fairy loves bath time and only uses Gorgeous Guineas Shampoos and other aromatherapy products. 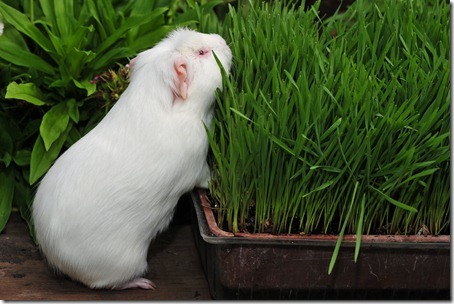 Her grassy treats are sourced from Karen at Planet Guinea. Here’s Fairy – what a little angel! One of Piggy Palaces creations! hello pretty little fairy ! its so wonderful to see all the sweet photos, to read your stories and to enjoy here. 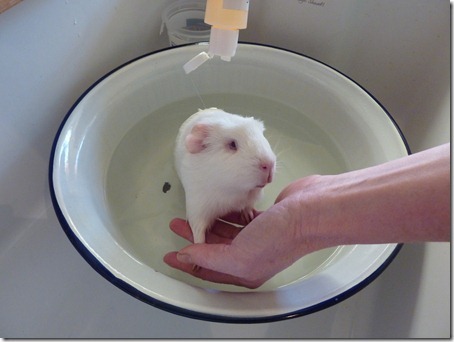 you are a brave, precious and beauty little white piggy. i wish you an your guineafriends all the best and leave a kiss on your fur ! 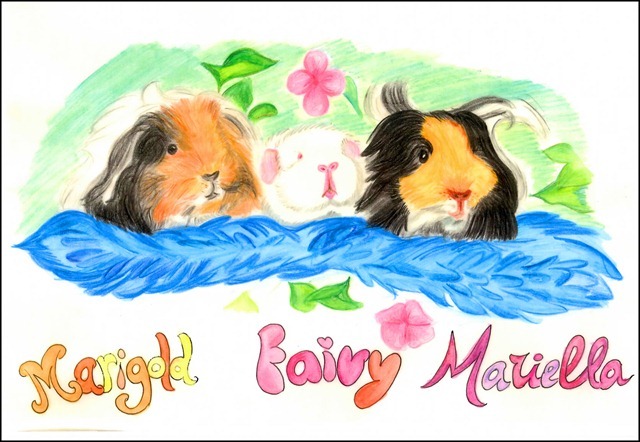 gx from ingrid and the 11 german guineapigs here. Fairy And The Tumultuous Tower Of Cosy-Comfort Device! And Finally . . . Christmas is HERE! The Start of Fairy’s Big Day!